THE NAMES OF the 23 people killed in the deadliest US tornado in nearly six years were released by the coroner today, revealing that one extended family lost seven members. Among the victims were four children, including 6-year-old Armando Hernandez Jr, who was torn from his father’s arms; and 10-year-old Taylor Thornton, who was visiting a friend’s home when the twister struck. Jimmy Lee Jones, 89, perished along with his wife of six decades, Mary Louise, and one of their sons. Meanwhile, the search for victims in and around the devastated rural community of Beauregard continues; seven or eight people are still missing. AJ had taken shelter in a closet with his father and older brother when the tornado hit, said Jack Crisp, the boy’s uncle. The punishing winds tore the family’s home apart, Crisp said, and pulled both boys from their father’s arms. The boy’s father and brother both survived. The body of David Wayne Dean, aged 53, was found by his son in a neighbour’s yard after the twister demolished his mobile home. “He was gone before we got to him,” said his sobbing widow, Carol Dean, who was at work at Walmart when the storm hit. My life is gone. He was the reason I lived, the reason that I got up. It was the deadliest tornado to hit the US since May 2013, when an EF5 twister killed 24 people in Moore, Oklahoma. 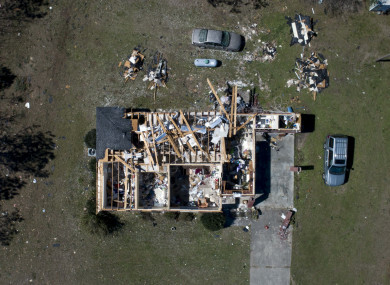 The tornado brought winds estimated at 170 mph and carved a path nine-tenths of a mile wide in Alabama, scraping up the earth in a phenomenon known as “ground rowing,” the National Weather Service said. It traveled a remarkable 70 miles or so through Alabama and Georgia, where it caused more damage. Ninety people were injured in the Beauregard area, authorities said. Many of the people living in the area are senior citizens who moved to the country after retiring from textile mills or an old magnetic-tape manufacturing plant that closed years ago, it was reported. Email “Fatal Alabama tornado: 7 members of one family and four children among victims”. Feedback on “Fatal Alabama tornado: 7 members of one family and four children among victims”.